Apple’s iPod enjoys a sizable share of the market for digital-music players. Its iTunes Store enjoys an equally formidable share of the online music market. And its brand remains one of the most recognizable in the world. So what can aligning its iPod and iTunes offerings with a television program do for Apple, even when the program in question is as popular as the Fox Network’s American Idol? “Apple’s involvement with American Idol brings a number of benefits, including more exclusives to iTunes, closer association with TV and music (particularly emerging artists), and exposure on one of the top-rated shows on television,” said Ross Rubin, director of analysis at market-research firm NPD. Earlier this week, Apple and Fox unveiled a partnership that links their respective iTunes and Idol franchises. Under the terms of the deal, performances by American Idol contestants will appear on the iTunes Store the day after they’re broadcast on television. American Idol fans can also pre-order performances from their favorite contestants from the iTunes Store, which will be automatically downloaded the day after the show airs. And the store will have the music tracks of the top 24 semifinalists available for purchase for 99 cents per song. 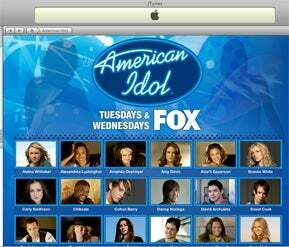 Fox’s American Idol figures to become a common sight at the iTunes Store now that Apple has inked a deal with the reality TV show. Having the exclusive songs and videos with Fox is certainly a coup for Apple, but that is only a small piece of the puzzle. When it comes down to the real benefits for Apple, it’s all about the brand. As first reported by Variety, the iPod will become the TV show’s official digital music player while the iPhone becomes its official handset; those products are likely to be integrated into future episodes, similar to products from other American Idol sponsors such as Coke, AT&T, and Ford. The deal certainly represents the union of two very recognizable brands. Apple’s iPod enjoys a 67 percent share of the market for digital-music players, according to the most recent figures from NPD. The iTunes Store remains a popular retail destination for online music, even with growing competition from rivals like Amazon.com’s Amazon MP3 service—just last month, Apple reported that iTunes had sold its 4 billionth song. As for American Idol, it’s one of the most-watched programs on network television—just this week, the show powered Fox to three consecutive nights of ratings wins, according to entertainment news site Zap2it. But how much overlap already exists between Apple’s music products and the Idol audience? Given the iPod’s ubiquity, isn’t placing that product on American Idol little more than preaching to the choir? And that’s important to Apple. While the company continues to sell a large amount of handheld devices—more than 22 million iPods and 2 million iPhones during its fiscal first quarter—the growth of iPod sales has slowed, especially compared to booming growth enjoyed in past years. Keeping the music player at the forefront of people’s minds by placing it on a TV show they’re likely to watch could be part of Apple’s efforts to make sure that its products continue to rule the digital music roost.